Eric Hamilton's Business & Technology Blog: Finish Him! According to Reuters, the California Supreme Court eliminated a ban on the sale of violent video games to minors. Reuters goes on to say "Governments cannot ban the sale or rental of violent video games to minors because it would violate free-speech rights, the U.S. Supreme Court said on Monday in its first ruling in a video game case." 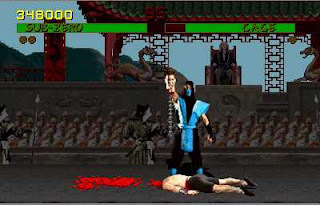 In 1991 Midway released Mortal Kombat which is/was a very violent fighting game. There have been several sequels to this hit video game. Mortal Kombat was most famous for its "Finishing Moves" which were death blows to be completed at the end of each 1-on-1 match. Finishing Moves consisted of decapitations, gripping out of hearts and spines and other gruesome acts of violence. Video Ads Powered by AdSmoke. Now the California Supreme Court says anyone, regardless of age, can buy or rent these games. So, what do you think? It’s great that you have published such knowledge. I just hope these are all reliable. It would be better if you also include in your page the references that you are using. Thanks!